Roman emperor; born in the year 86; died in 161; ruled from 138 until his death. The reign of this just and humane emperor came like a blessing to the Jews, particularly to those of Palestine. The religious persecutions of Hadrian had devastated the country, depopulated the cities, and made the intellectual development of the Jews impossible. Had these conditions lasted much longer, there would have been an end to the Jewish people in the Roman empire. As soon as the Jews knew of the change of rulers, they sent an embassy, with R. Judah b. Shamu'a at its head, to Rome to negotiate for improvement in their condition (Meg. Ta'anit, xii.). Through the intercession of an influential matron they succeeded in procuring milder treatment. On the fifteenth of Ab (Aug., 138 or 139) the emperor permitted the burial of the Jewish soldiers and martyrs who had fallen in battle against the Romans, and whose interment had been put under severe penalty (Yer. Ta'anit, iv. § 5, 69a; Ta'anit, 31a). 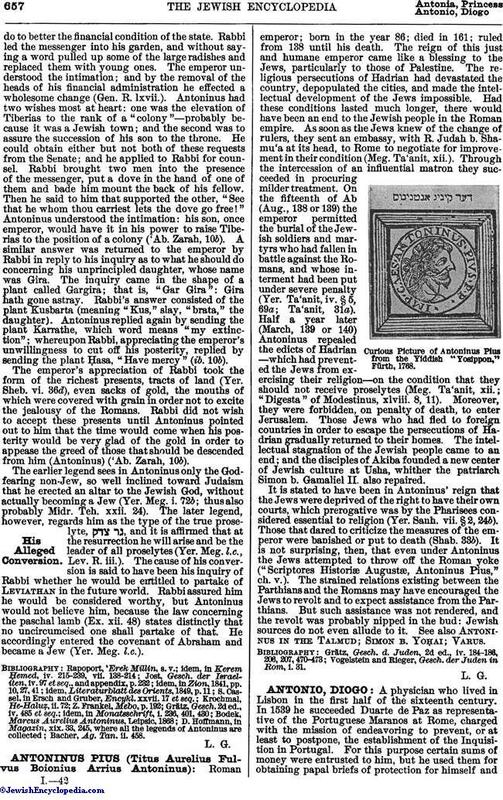 Half a year later (March, 139 or 140) Antoninus repealed the edicts of Hadrian —which had prevented the Jews from exercising their religion—on the condition that they should not receive proselytes (Meg. Ta'anit, xii. ; "Digesta" of Modestinus, xlviii. 8, 11). Moreover, they were forbidden, on penalty of death, to enter Jerusalem. Those Jews who had fled to foreign countries in order to escape the persecutions of Hadrian gradually returned to their homes. The intellectual stagnation of the Jewish people came to an end; and the disciples of Akiba founded a new center of Jewish culture at Usha, whither the patriarch Simon b. Gamaliel II. also repaired. Curious Picture of Antoninus Plus from the Yiddish "Yosippon," Fürth, 1768. It is stated to have been in Antoninus' reign that the Jews were deprived of the right to have their own courts, which prerogative was by the Pharisees considered essential to religion (Yer. Sanh. vii. § 2, 24b). Those that dared to criticize the measures of the emperor were banished or put to death (Shab. 33b). It is not surprising, then, that even under Antoninus the Jews attempted to throw off the Roman yoke ("Scriptores Historiæ Augustæ, Antoninus Pius," ch. v.). The strained relations existing between the Parthians and the Romans may have encouraged the Jews to revolt and to expect assistance from the Parthians. But such assistance was not rendered, and the revolt was probably nipped in the bud: Jewish sources do not even allude to it. See also Antoninus in the Talmud; Simon b. Yoḥai; Varus. Vogelstein and Rieger, Gesch. der Juden in Rom, i. 31.